This highly versatile shaping clay gives great definition and volume. A matt clay that gives the hair superb styling control with an incredible hold. Great for finger styling to add texture or for use as a strong architectural styler. Washes out easily in water. Apply a small amount to fingers and rub to soften. Apply to hair sections for desired style. For additional lift, apply to the roots of the hair. Washes out with shampoo easily. Aqua, Petrolatum, Lanolin, Peg-40 Hydrogenated Caster Oil, Cera Alba, Cetyl Alcohol, Isopropyl Myristate, Paraffinum Liquidum, Copernicia Cerifera Wax, Pvp, Alcohol Denat, Pvp/Va, Polyacrylamide, C13-C14 Isoparaffin, Laureth-7, Phenoxyethanol, Isopropyl Paraben, Butyl Paraben, Isobutyl Paraben, Parfum, Citral, Critonellol, Hexyl Cinnamal, Limonene, Linalool, Hydroxyisohexyl 3-Cyclohexene, Carboxaldehyde, Ci60725. I love this hair product looks great and smells amazing. Good hold and natural look without feeling gunky, sticky, clumpy or crusty. A quality product from a quality brand. I expected more clay'ish texture once I opened it. Already started to write an e-mail to mankind to refund the product and exchange it with the putty clay of the same brand. Ended up using the product anyways and its above expectations. It's a fibery texture with nice matte/dry feel once applied to the hair. Combining it with hairspray to create a more sustaining hold, the product itself gives great remodel possibilities through the day. Product for those who have/like: - medium to short hair. - fiber texture hairproducts, if you prefer more dry clay go buy the matte clay. - a good bang for a great price. - a styling-product with great smell, my girl loves it ;). - easy wash out products, it's waterbased! - a good hold and a ''non hair product used''/matte look. Cheers from the Netherlands! This is a great product. I use to use Alterna Moulding clay (hemp). Recently they stoppped making it and looking for an alternative was becoming stressful. I found this and I couldn't be happier. I am now on my 2nd tub and will be getting more shortly. This mixed with the LS&B thickening wash and I am ready to go. If you are notsure what to get between this and the American Crew, then go with LS&B, gives you that more modern look and doesn't get clumped up in your hair. Definitely for shorter hair. It's so thick you risk leaving unmelded gunk strands. However this smells awesome. If they made this into a scent I'd buy by the gallon. I wonder if there's anything similar out there. I was in search of a replacement to my usual order of AC Fibre and AC Forming Cream when I decided to mix it up a bit and try another brand. Came across LS&B which doesn't seem to have many reviews online, so I took a punt. I wasn't disappointed! For me, this product beats it's AC rivals on duration (has great hair control for much longer), value for money (you get 100g for same price and the product goes a longer way), scent (this has a fairly strong scent which is nicer than AC), styling (about the same for both brands but my hair personally looks healthier and styles better with this stuff in). There are cons though hence the 4 stars.....this doesn't wash out as easily as AC and having a scented hair product is not always a good thing if you are wearing other fragrances. Overall though, unless I see a similar AC product on a really good offer, I have definitely been converted to LS&B! This 85 Karats Shaping Clay is excellent if you have short to medium length hair - any longer and it struggles to hold adequately. It smells great and washes out relatively easily too. Definitely worth a try! 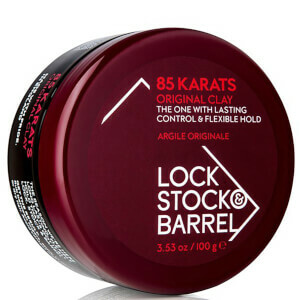 85 Karats is the best hair product I've ever used. I've tried many different brands but nothing even matches this, it's a great styling aid and it is so easy to use with a Great smell, it never fails. I've used this product for 6 years +, but now the formula has changed. Why change something that works, this product is now a shadow of what it used to be. I have been using this product for about 2 weeks, I thought I would try something different to the usual that I normal purchase, it does a similar job and does it well but you have to use twice as much (maybe more) product as you would with my previous. I have thick short hair and like to rough it up a bit. I used to love this product, but they have now changed the product. What was excellent is now very average, bring back the original! This stuff was amazing but comparing the older 85k to the new 85k it doesn't give the hair the same texture and look it once did!!!! Yes a great British product - does the job well and smells great to!! Easily on par with American Crew Fiber and Woody's HeadWax Web!!! I have tried most of the grooming clays available on the high street, and premium brands, and this is by far the best! Gives me definition, nice matte finish and washes out easily. Definitely worth a try, and now a staple in my bathroom. All I can say about this product is that it does just the job. I have my hair funky and spiky. I used fudge hair shaper before this and it was great but seemed to loose its strength after a few hours. But not this! It keeps my hair looking its best all day and night. I love the smell also. I really like the soak wash too that you can get. My hair is so thick and moisturized now. The clay washes out in an instant. Its great and fragrance is real nice. Good job LSB.